If a constant direct current (mA) of a low voltage (V) is applied to the electrode to generate an underwater discharge, the inside of the generating unit becomes a plasma state to generate a large amount of anion. In this process, water molecules are decomposed into hydrogen ions (H +) and oxygen ions (O-), and the anion, oxygen ions, generates hydroxyl groups (OH-) while keep reacting with other water molecules in the vicinity. The hydroxyl group (OH-) and the oxygen (O-, O3-) anions generated in this way have a sterilizing and impurities removal effects against bacteria due to its strong antimicrobial and oxidative power. (Have 99.9% germicidal power against Super bacteria (MRSA), Pseudomonas aeruginosa (athlete's foot), Mutans bacteria (Candidiasis), Candida (Inflammation), Staphylococcus (gum disease), Escherichia coli, Staphylococcus aureus (food poisoning), Salmonella (food poisoning) etc. Our product is constructed to exchange ions between two electrode plates by applying different electrodes with ion exchange material between two electrode plates. Water used as potable water and water used as reactive water is separated. 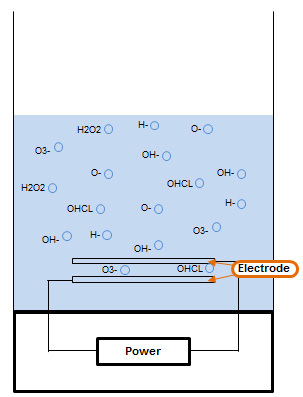 When a constant direct current (mA) of low voltage (V) is applied to the electrode, ion exchange occurs between the drinking water and the reaction water. Hydrogen is generated in the water to be used as drinking water and oxygen and ozone are generated in the water to be used as the reaction water. When oxygen and ozone generated in the reaction water escape to the connected path, ozone is removed by the harmful gas removing filter to exhaust pure oxygen only to the outside.